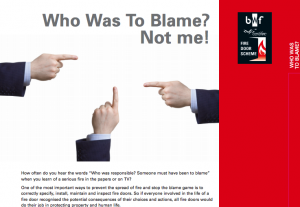 Who was to Blame? Not me! BWF Certifire – guidance on correct design and fitting of fire doors explains who should ensure that fire doors are fitted and are working correctly. Because no one wants to take responsibility the lines become blurred through the various stages of the process, even through inspection.